"Advancements of this kind, for image processing, don't come along very often," says Jon Grodem, Optoma Americas, Senior Director of Product Management. In a major licensing win for home entertainment system products, DarbeeVision, Inc., a pioneer in the field of digital image enhancement, has licensed its Visual Presence technology to Taiwan-based Optoma for their Model HD28DSE DLP projector. The HD28DSE integrates real-time DARBEE Visual Presence image processing for enhanced depth, clarity and realism to the projected image. This is a first for projector systems, and a new exciting feature that creates best-in-class image quality. Optoma's projectors are recognized for cutting-edge features and quality, making them a natural fit to partner with DarbeeVision. "Advancements of this kind, for image processing, don't come along very often," says Jon Grodem, Optoma Americas, Senior Director of Product Management. "Looking at the DARBEE Visual Presence solution, we understood very early on, that integrating this technology in our projectors would give us a major competitive advantage in the market. We evaluated the image enhancement and integration challenge extensively and concluded that benefit for image quality was profound and the implementation was simple. The ability to offer DARBEE Visual Presence, means that we will have a best-in-class image quality position and we are excited to see the market reaction to the new DARBEE enabled, HD28DSE, model." The HD28DSE is a high definition 1080p DLP projector with 3000 lumens, 30000:1 contrast ratio and weighs in at just 5.7 pounds. The HD28DSE is an ideal video projector for movie watching and gaming in the home or on the road. Two HDMI ports allow the HD28DSE to easily connect to laptops, Blu-ray/DVD players, gaming consoles and digital set-top boxes. MHL connectivity on port one makes it easy to wirelessly share content from MHL devices, such Roku's Streaming Stick, tablets and smartphones, to connect directly to the projector to play back music and video, view pictures and even share webpages and other user-generated digital media content. The HD28DSE is 3D-ready for an even more immersive gaming or movie experience. 3D content can be displayed from almost any 3D source including 3D Blu-ray players, 3D broadcasting and the latest generation gaming consoles. 3D glasses are sold separately. 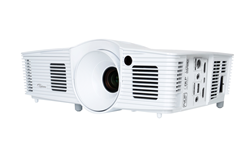 Complete details on the new HD28DSE as well as all Optoma projectors are available from http://www.optomausa.com. DARBEE Visual Presence represents a major advancement in the field of image processing. This enhancement technology leverages a discovery, made by Paul Darbee, that you can restore the image depth and quality that was lost at the moment of capture or creation. Images and video do not have to be flat anymore because DARBEE Visual Presence restores the dynamic range and realism that is lost during capture, compression and scaling. This makes DARBEE Visual Presence the ultimate image quality solution for all digital image and video content, no matter where in the video chain it is applied. DarbeeVision is offering its DARBEE Visual Presence technology for consumer electronics product integrations. Please visit http://www.darbeevision.com or call 714-787-1006 ext. 704 for more information. DarbeeVision Inc. was founded by Paul Darbee and Larry Pace to commercialize system products, discrete hardware, and embedded solutions based on Darbee Visual Presence Technology. DarbeeVision is offering its Darbee Visual Presence technology for consumer electronics product integrations. The privately held company is headquartered in Orange, California, USA. For information call 714-787-1006, email info@darbeevision.com, or visit http://www.DarbeeVision.com. All DarbeeVision™, DARBEE™ patents, trademarks, copyrights and licensing are property of DarbeeVision Inc™.